I don’t know where to start describing Barazek to people who are not familiar with this traditional Syrian pastry. The title of the post makes it seem like a simple recipe, but it’s definitely not your average everyday treat. 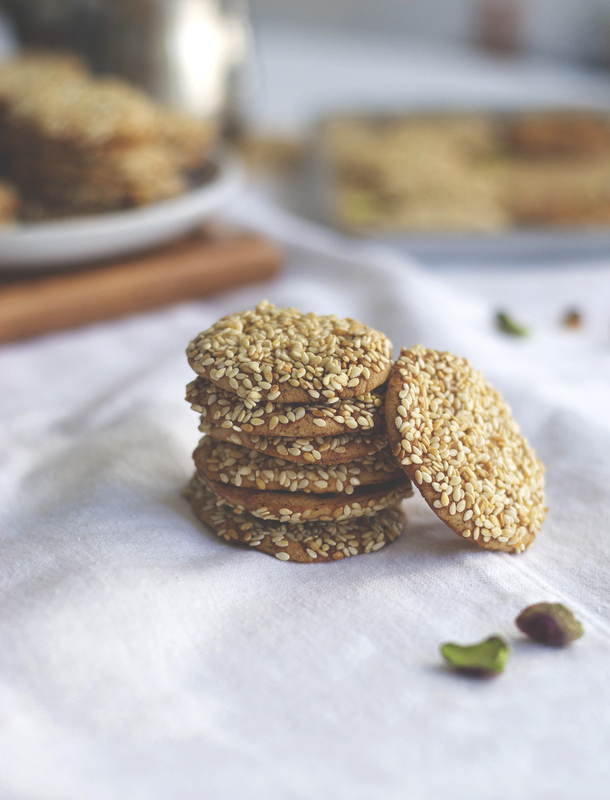 The buttery crunchy texture of the thinly spread baked dough is contrasted with chewy toasted honey sesame seeds on one side and pistachios on the other side. 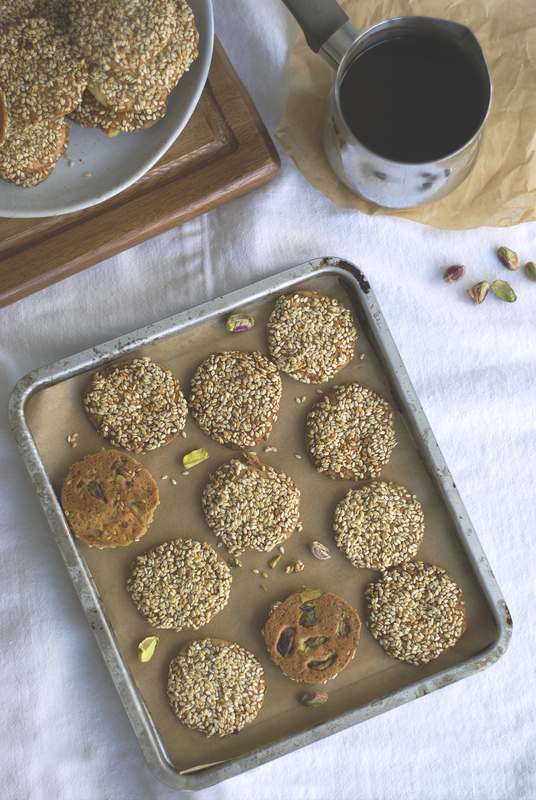 They inevitably remind me of long lazy afternoons in Beirut, drinking arabic coffee with the extended family, and devouring these wickedly addictive cookies. Damascus is known for creating the best barazek that are typically bought in tin boxes with other delicious sweets that the city is famous for. They’re made from butter (or ghee), flour, sugar, milk, and ground mahleb – a spice made from ground cherry stones. The dough is then coated with honey syrup, sesame seeds, and pistachios. My family used to get these bite sized cookies from a sweet shop called Semiramis and I distinctly remember them having a very deep golden color with a serious sesame flavor. Lately I’ve been itching to try my luck in making them from scratch (especially that Syria feels like a world away), so I tried my best to recreate the same texture and taste here. It was a very tough process because of all the recipe variations available: some called for eggs, others called for adding semolina, rose water, cream of tartare, even vinegar! It’s quite the dilemma. After a lot of tinkering in my kitchen, I felt hopeless at times when the end result was not at all what I was aiming for, and at other times I felt like I conquered the world when the barazek turned out just as good as the ones we used to get from Damascus. None of my friends or family believed me when I said that each bite made a good reason to spend a ridiculous amount of time making them (this recipe yields 90 cookies!). But let me assure you that they’re worth every effort and you can always freeze them for later cravings. I never tried freezing the dough, but I’m sure that it freezes just as well as any other cookie recipe. Makes approx. 90 cookies, 4cm- 1.5in diameter – They taste batter the next day! 1. Combine honey and water in a small saucepan. 2. Place over medium heat and bring to a simmer, stirring until honey dissolves (Around 3 minute). 3. Remove from heat and let it cool down. 1. 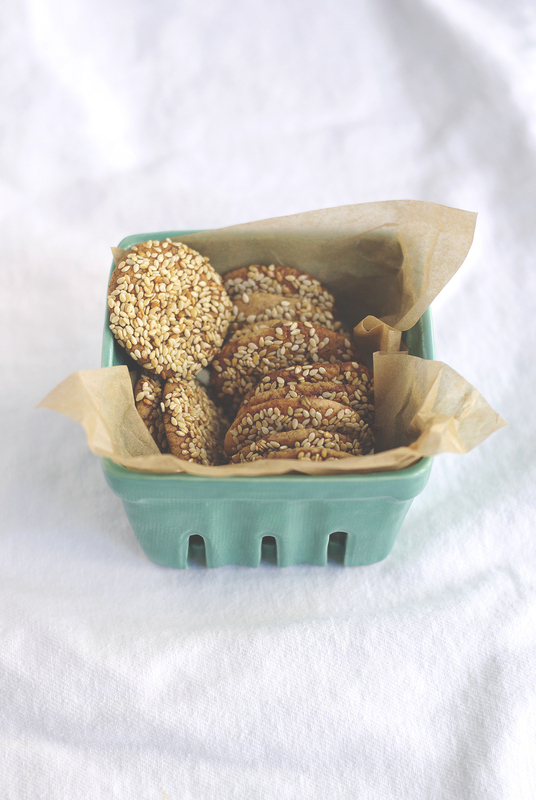 Toast the sesame seeds in a dry skillet over medium heat for 3-5 minutes until lightly browned, stirring occasionally. Set aside to cool. 2. In a large bowl cream the butter and sugar (or use your hands). 3. Add ground mahlab and baking powder and mix. 4. Add yeast and flour and mix until homogeneous. Gradually add the milk to form a smooth hard dough (you might use less milk to avoid a tender dough). 5. Cover dough in plastic wrap and let it sit at room temperature for at least 15 minutes. 7. Pour enough honey syrup on a medium sized plate just to cover the surface and sprinkle the sesame seeds on top (don’t use all the sesame, just enough to cover the syrup). Place the chopped pistachios on another shallow plate. 8. Shape about a teaspoon of dough into a ball and flatten slightly with the palm of your hands. 9. Dip one side into pistachios, flip and press the other side with the sesame mixture using your fingers to press the dough into a flat disc. 10. 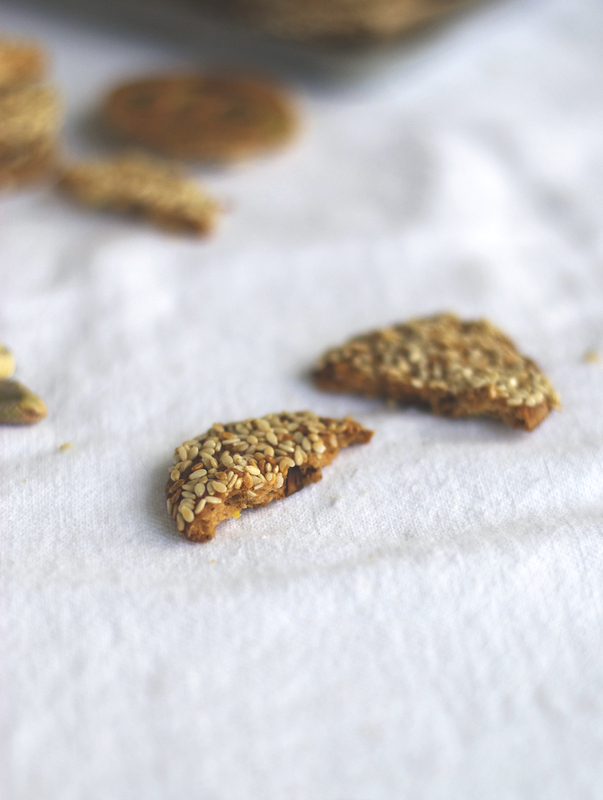 Place the cookies sesame side up on the baking sheet about an inch (2 cm) apart. 11. Bake for 25-30 minutes, rotating halfway, until the edges are a deep golden color. 12. Store in an air tight container up for up to two weeks or freeze for up to 2 months. I have been surfing the internet for a barazek recipe for about half an hour. The way you write about them has convinced me this is THE recipe. I understand exactly what you mean. I am going to compare and contrast a few recipes tomorrow. Lets’ see!